This Special Skill defines the so-called perimeter weapons and pieces of Equipment that move around their bearer. In the Reactive Turn, to activate Stand By Mode the Active trooper must be in LoF or ZoC of the bearer when declaring or executing his Order. When deploying the bearer, the player also places all Perimeter weapons or pieces of Equipment, known as Perimeter Items, this trooper has totally inside his Zone of Control, but following the Deployment general conditions. When deploying these Perimeter Items, no enemy trooper can be inside their Zone of Control. The player can check the ZoC when deploying them and adjust their placement to keep this rule. Otherwise, if due to a Dispersion or to the Deployment conditions the player cannot avoid having any enemy troopers inside his ZoC, Perimeter Items cannot be deployed, and the player must consider them wasted. Active Turn. Perimeter Items are activated by each Order declared by their bearer. Each time the bearer declares Cautious Movement, Climb, Move, or Jump, his Perimeter Items will perform the same Skill. If the bearer declares any other Skill different from the previously mentioned ones, the Perimeter Items will do nothing, considering it an Idle. When moving, the Perimeter Items must keep Coherency with their bearer. Each time the bearer declares an Order an Initial and Final Coherency Check must be performed. Reactive Turn. Each time the bearer declares an ARO an Initial and Final Coherency Check must be performed. In the Reactive Turn, a Perimeter Item can only perform a Boost. If the Perimeter Item is able to declare Boost, its ARO will be always different from the bearer's. Stand By Mode. In Stand By Mode, the Perimeter Item stands still where its bearer placed it until activated by an enemy trooper. Spending one Short Skill or ARO, the bearer can place any number of his Perimeter Items in Stand By Mode, pointing it with a Stand By Marker. This action is considered an Attack. A Perimeter Item cannot be placed in Stand By Mode if there is an enemy Camouflage or TO Marker inside its Zone of Control. This rule does not apply if there is a valid, non-camouflaged enemy inside the ZoC. A Perimeter Item which is not in Stand By Mode will enter the Disconnected state at the end of the Order in which it breaks Coherency with its bearer or if its bearer enters the Isolated, or any Null state. For the purposes of the Expendable Trait, a Perimeter Item is spent when it detonates, it is in Disconnected state, or it is placed in Stand By Mode. An enemy trooper must declare or execute an Order inside the ZoC of the Perimeter Item. The enemy trooper must be in an accessible location inside the ZoC of the Perimeter Item when declaring or executing the Order. When Boost is declared, the Perimeter Item will always move until it reaches base to base contact with the target, no matter how far the target is inside its Zone of Control, and considering it has the Super-Jump and Climbing Plus Special Skills for the purposes of declaring its trajectory. The weapon or piece of Equipment detonates automatically at the end of its movement, when it reaches base to base (or Silhouette template) contact. Once Boost is declared the Perimeter Item always reaches the target, ending its movement and detonating in base to base or Silhouette Template contact. When a Perimeter Item declares Boost, it can exit the Zone of Control of its bearer. Boost cannot be declared if the path from the Perimeter Item to the target is blocked, for example by an impassable obstacle (like a wall of infinite height, a closed door or sealed room...) or a space too small for the Silhouette template of the Perimeter Item. Perimeter Items are not activated by enemy Camouflage, TO or Impersonation Markers, nor by any Special Skill or piece of Equipment whose description specifies so. Once the Perimeter Item has detonated it must be removed from the game table. The detonation of a Perimeter Item can only avoided by successfully making a Dodge Normal Roll. The Moran Akinyi, a Nomad Maasai Hunter with two CrazyKoalas (a Perimeter weapon), declares a Move + Discover Order. With the first Short Skill of that Order, Akinyi will move, with his two CrazyKoalas moving and keeping Coherency with him. In the second Short Skill of the Order, Discover, the CrazyKoalas will not do anything because in the Active Turn they can only move. With the last Order of the Order Pool of his Combat Group Akinyi declares a Move + Move Order. He moves up to a wall with his CrazyKoalas following him. During his adversary's Active Turn the Fusilier Angus, who is on the other side of the wall, declares the first Short Skill of an Order: Move. 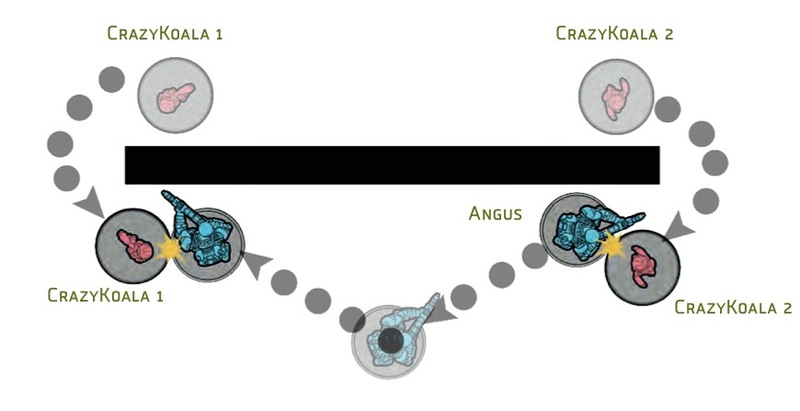 This activates the two CrazyKoalas, because he is inside their Zone of Control, so they declare Boost and their trajectory: CrazyKoala #2 will move around the wall to impact on Angus at the beginning of his movement while CrazyKoala #1 will move around the wall from the other side to impact on him at the end of his movement. Seeing that he is in range of the two CrazyKoalas, Angus, desperately declares the second Short Skill of his Order, Dodge. He must succeed at a PH Normal Roll to avoid the two Attacks. His PH Attribute value is 10, and he rolls a 5, succeeding at the roll, so he dodges both Attacks. CrazyKoala #2 activates and runs towards Angus when he is starting his movement, getting into base to base contact and detonating automatically. Meanwhile, CrazyKoala #1 activates and runs towards Angus from the other side of the wall, entering in base to base contact and detonating at the end of the Fusilier's movement. But, since Angus succeeded at his Dodge roll he doesn't suffer damage and the CrazyKoalas must be removed from the table. If Angus had failed his PH Roll, then he would have to make two ARM rolls against Damage 15, applying the Shock Special Ammunition rules, removing the CrazyKoalas from the table after detonation. Within military confines, the term tactical perimeter devices is used for automated zone defense systems. These devices have been specifically designed to protect the immediate perimeter of their user, and also to detect and/or dissuade intrusion attempts during the user's security duties, either within a zone of operations or in especially sensitive facilities. This page was last modified on 25 January 2017, at 18:21.